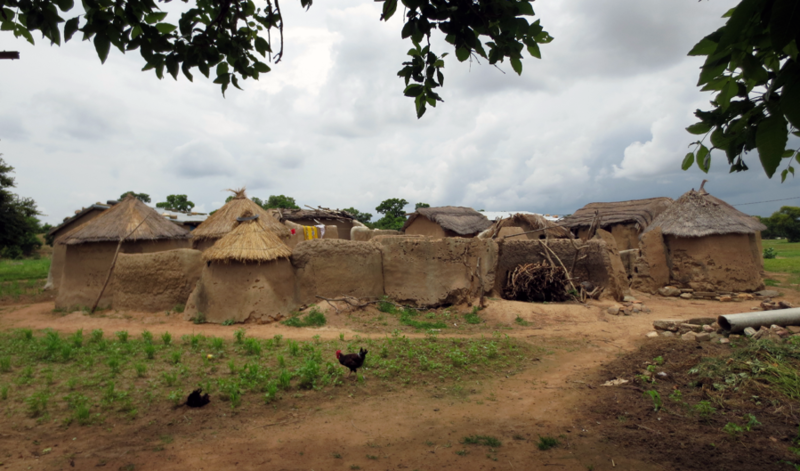 Kongo, Nabdam District. Irrigated fields. My research focuses on understanding the socio-economic and ecological drivers of land degradation in this region of Ghana as well as understanding the barriers that prevent farmers from adopting sustainable land management practices (SLM) to combat land degradation. SLM practices are one of the best ways to combat and reverse land degradation and enable farmers to maximize the economic and social benefits from the land while maintaining and enhancing the ecological functions of the land. These practices include soil fertility and crop management, soil erosion control measures, water harvesting, forest management etc. Widnebe, Bawku East District. Farmers in rice field. Burkina Faso is located on the other side of the hills. To get a sense of how land degradation is affecting farmers’ livelihood and the kinds of land management practices they use to prevent it, my translator and I visited six communities in these two districts. Deborah, my translator is from this region and growing up working on her parents’ farm she has a keen understanding of the social and economic drivers of land degradation and the motivations, goals and constraints that drive farmers’ decisions about how to manage their land. 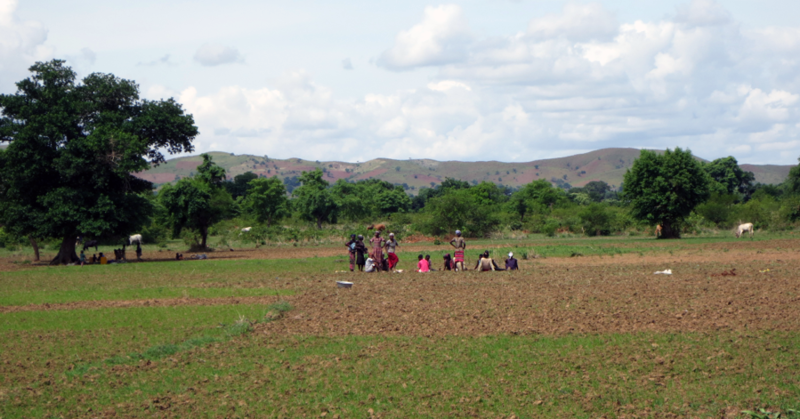 We used a variety of participatory approaches to first get a clear picture of how land degradation is affecting each community and second to understand the barriers that prevent farmers from adopting more extensively SLM practices. During these exchanges, Deborah was invaluable as she was able to explain clearly the purpose of our visit and elicit very specific responses to our questions. Because we spent so much time together (24/7 for six weeks) farmers could easily see that we were true collaborators and that we enjoyed working together. As a white female researcher, this close relationship with an African female researcher helped break the racial barrier and created an atmosphere of trust between the researchers and members of the community. 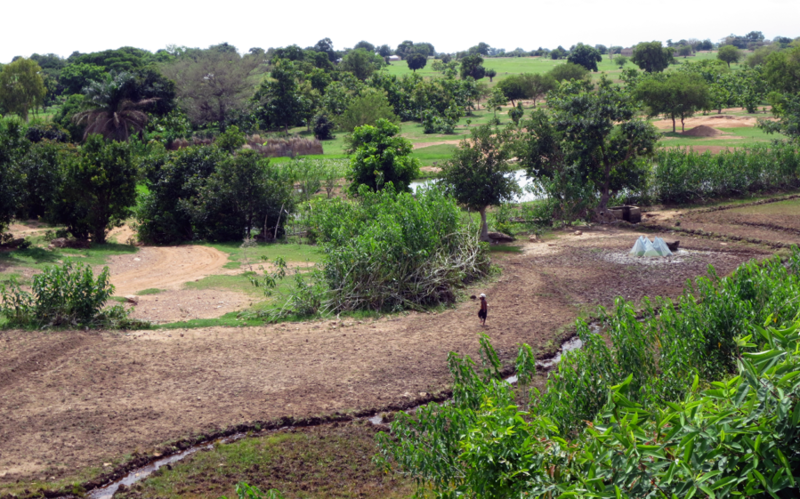 Dasabligo, Bawku East District. House compound surrounded by fields of maize and sorghum. 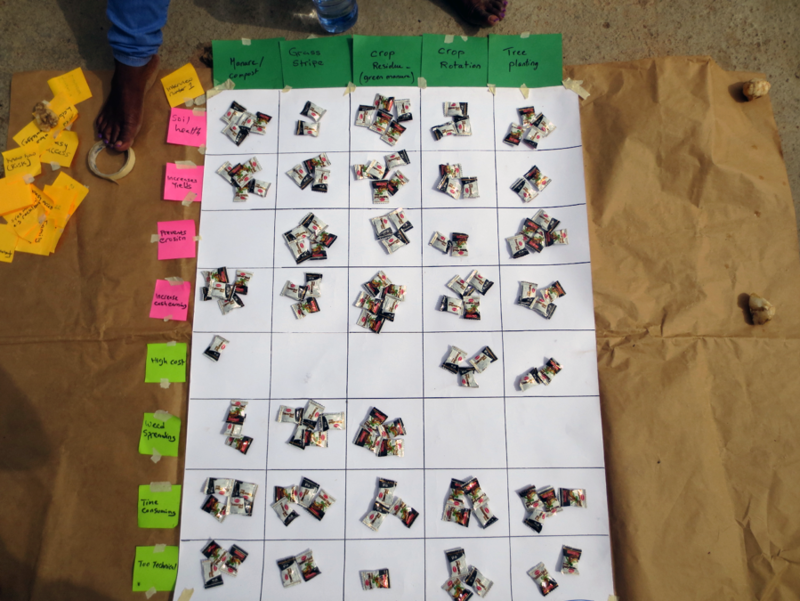 Participatory research approaches have been shown to enhance knowledge exchange between researchers and stakeholders (in this case the farmers of northern Ghana) and also to increase the likelihood that this co-produced knowledge will be incorporated into decision making. With participatory research, stakeholders fully contribute to the research process whose goal is to develop solutions to their particular problem because it is adapted to the social and ecological context and the needs of stakeholders. Ankpaliga, Bawku East District. ELMO step 6: farmers rank (with the input from the family cat) the importance of the SLM practices they use. 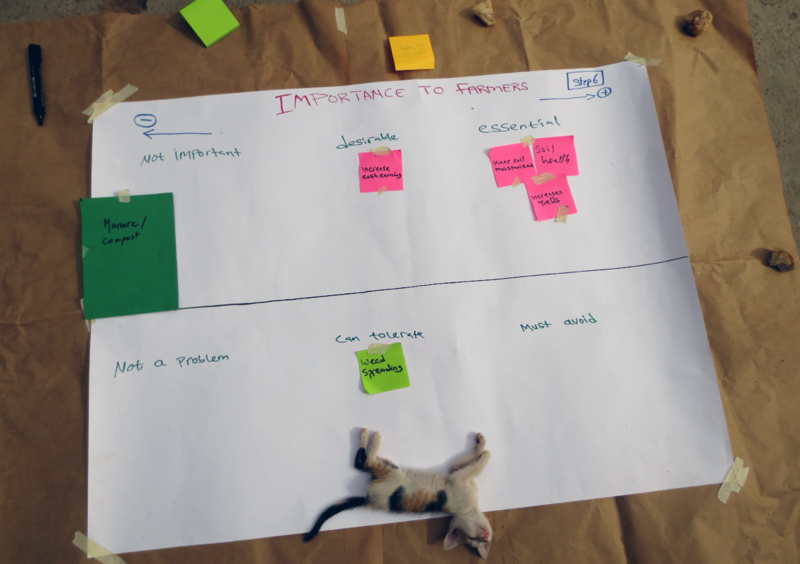 To understand the specific context of farmers’ choices, trade-offs, and barriers for selecting land management practices, we used a participatory tool called ELMO (Evaluating Land Management Options) developed by the International Center for Tropical Agriculture (CIAT). This tool was developed in recognition of the complex factors that drive farmers’ land use decisions. ELMO is organized around three basic questions and entails 10 steps. It is technically simple to implement, with pens, cards, flip charts, ‘counters’ (such as beans or stones) and a camera (for documentation) being the only required equipment. Structured discussions and prioritization exercises shed light on farmers’ preferences for different land management practices and to investigate the cost, benefits, motivations and enabling conditions that influence the adoption or rejection of SLM. ELMO is very useful to better understand farmers’ own perceptions and explanations of the advantages, disadvantages and trade-offs associated with different land management choices as they relate to their own needs, motivations, opportunities and constraints. Ankpaliga, Bawku East District. ELMO final step 7: farmers vote on the advantages and disadvantages of each SLM practice they use.